The Annals of Nuclear Cardiology is an international scientific peer-reviewed journal and the leading scientific journal with a specific focus on nuclear cardiology in Asia. As the official publication of the Japanese Society of Nuclear Cardiology, the Annals of Nuclear Cardiology offers novel clinical and technical findings presented through original articles, review articles, and timely discussions related to nuclear cardiology. The Japanese nuclear cardiology community has broadened the field of diagnostic imaging to include such applications as metabolic imaging, sympathetic nervous imaging and inflammatory imaging, some of which are now playing important clinical roles around the world and gaining approval by such bodies as the United States Food and Drug Administration. The Japanese Society of Nuclear Cardiology is pleased to deliver important region-specific information on these developments through its publication of the Annals of Nuclear Cardiology. 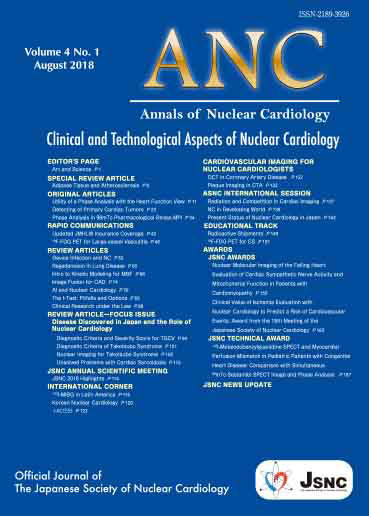 As the only scientific journal providing an examination of the future of nuclear cardiology outside of North America, the Annals of Nuclear Cardiology focuses on the roles of nuclear cardiology imaging in region-specific cardiovascular disease, health care policy related to nuclear cardiology and region-specific diseases, key aspects of newly announced clinical guidelines related to nuclear cardiology and region-specific cardiovascular disease in Asia and outside of North America, and preliminary research topics in addition to other general topics.